Seattle Moving - Throughout Seattle, we are the moving company that can get the job done including the careful and efficient handling of pianos, hot tubs, pool tables, and other large bulky items that not all moving companies have the tools or knowledge to move safely. Bellevue Moving - We serve Bellevue, Factoria, Medina and surrounding communities. Kirkland Moving - In Kirkland, we service the entire city and areas like Houghton, Juanita, and Totem Lake. Shoreline Moving - In and around Shoreline, you can count on Careful Movers for efficient and courteous moving. Redmond Moving - Throughout Redmond, and outlying neighborhoods, we are the residential movers who aim to get every job done efficiently. Woodinville Moving - In and around Woodinville, we move suburbia as well as rural estates, including pianos, hot tubs, and pool tables. Kenmore Moving - We serve Kenmore and surrounding areas with residential and commercial moving, and throughout the Greater Puget Sound. Mercer Island Moving - We can move large estates right on down to high rise condos; whatever your needs are call us for experienced moving. Medina Moving - We relocate people to and from Medina and areas around Lake Washington. Issaquah Moving - In Issaquah, we are the professional relocators for not just the city but new areas such as the Issaquah Highlands. Sammamish Moving - Even if you're off the beaten track, or in a brand new neighborhood still under construction, nothing is off limits for us in Sammamish -- even if all you need is a piano moved. Fall City Moving - Furnishings, clothing, glassware, electronics and more -- we move it all to or from Fall City. North Bend Moving - If you want to live near lots of summer hiking trails and plenty of winter skiing and snowboarding, North Bend is a good city to consider moving to. Carnation Moving - As experienced Eastside movers, that includes Carnation for local, long distance, pianos and hot tubs. Duvall Moving - Duvall may be a small town but like many area towns it has room for growth and we offer local and long distance moving both to or from Duvall. Federal Way Moving - A growing city means that Federal Way needs a lot of moving, and we are here to answer the call. Kent Moving - With so many jobs in the area, it's no wonder that many call Kent home; we help people relocate whether coming or going. Renton Moving - At Careful Movers we can tackle every aspect of moving to or from Renton. Auburn Moving - Auburn moving looks a lot like adjacent towns we provide services to; that means we are here when you need us. Enumclaw Moving - We serve Enumclaw and outlying areas with exerienced and reliable relocation services. Black Diamond Moving - Serving Black Diamond and adjacent areas with full service moving. Maple Valley Moving - A growing suburban community like Maple Valley needs professional moving services; remember to call Careful Movers. Burien Moving - Whether apartment or a home in Burien, you can rely on us for all your moving needs. Des Moines Moving - Get your move on in Des Moines; consider Careful Movers for everything related to relocation services. SeaTac Moving - We can do it all in SeaTac, including provide storage if you're moving to the North End of King County. Puyallup Moving - Seen it, done it, and moved it in Puyallup; we've moved over ten thousand customers and know towns like Puyallup well. Tukwila Moving - In the southend we move people in and around Tukwila offering a variety of services that includes piano moving, packing, and long distance relocation. Edmonds Moving - Relocation services to and from Edmonds, Woodway, the waterfront, and outlying neighborhoods. Everett Moving - We've been providing moving services to and from Everett for several years; affordable rate services. Lake Stevens Moving - In and around Lake Stevens, we even get to Machias, Lochsloy, and Granite Falls. Lynnwood Moving - We move Lynnwood and surrounding neighborhoods like Meadowdale and in and around the Alderwood Mall. Marysville Moving - Marysville is a growing city and that means a lot of needs for companies like ours. Arlington Moving - In and around Arlington, we offer residential and commercial moving to home owners and renters alike. Snohomish Moving - Another growing community is Snohomish, where we provide moving throughout the city and outlying rural areas. Mountlake Terrace Moving - Just down the street for us, we can have a moving truck and crew in Mountlake Terrace in about five minutes. Brier Moving - Yet one more city just down the street from our headquarters is Brier. Bothell Moving - If you're going to save money on moving, call a local company like ours for Bothell moving. Monroe Moving - We provide moving services to and from Monroe all four seasons of the year. Stanwood Moving - We offer moving to Stanwood, La Conner, and surrounding areas, and that includes pianos, hot tubs, and pool tables. Granite Falls - With so much growth taking place in Snohomish County, we are offering moving services to Granite Falls and the Mountain Loop Highway. Darrington - In the busy Puget Sound, there are still a few places further out with land for sale and homes on acreage. Darrington is one of those towns. Call us today for all your local and long distance moving needs. Lake Goodwin - We move across the Lake Goodwin area, whether you're coming or going we can tackle it. Silvana - Our Snohomish County moving includes the town of Silvana, still rural country for the most part. Whidbey Island - We offer moving services to or from Island County and small cities on Whidbey Island. Camano Island - For all moving related to Camano Island you're making a wise choice by going with Careful Movers. Tacoma Moving - With so many people in Tacoma, it is a great city for us to provide moving services to and from. Lakewood Moving - We provide Lakewood with relocation services of many kinds, including simple piano and hot tub moving. Bonney Lake Moving - Serving Bonney Lake and all of Pierce County, you can rely on Careful Movers for professional relocation services at affordable rates. Gig Harbor Moving- As the gateway to the Olympic Peninsula, Gig Harbor is a town undergoing a lot of growth and in need of our moving services, which we gladly provide. Buckley Moving - Covering Buckley and surrounding areas, you can count on Careful Movers services and affordable rates as well. Spanaway Moving - Across Spanaway, we are your relocation specialists for every step of your move. Lake Tapps Moving - We are experienced Lake Tapps movers for residential and commercial needs both. Bainbridge Island Moving - Having a new or existing customer on Bainbridge Island is worth the trip our crew has to make on moving day. Kingston Moving - Serving the Olympic Peninsula and Kitsap County, we offer Kingston moving at affordable rates including long distance moving. Bremerton Moving - With moving trucks on the Olympic Peninsula, we consider Bremerton and surrounding areas important places to offer moving to. Silverdale Moving - Whether by ferry or by highway, we move Silverdale and adjoining cities. Port Orchard Moving - A suburb with a small town feel that's a short drive to the Olympic Mountains are one reason people are moving to Port Orchard. When they do, we are here to offer moving services. Poulsbo Moving - We can get you moved into Poulsbo from across the state and have even done a lot of moving cross country; we have you covered to or from Poulsbo. 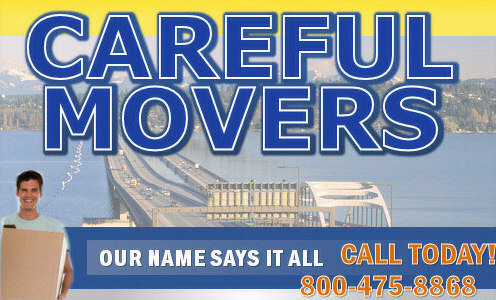 Kitsap County Moving - Throughout Kitsap County, call on Careful Movers for all your relocation needs. Lacey Moving - In and around Lacey, we move people across town and into or out of rural areas. Olympia Moving - Not only our state's capital, but an important city for us to move people to or from is Olympia. Anacortes Moving - If it's close to the San Juan Islands you want to get, then Anacortes is a great little city to consider moving to. Mount Vernon Moving - Despite a lot of rural area, we gladly move Mount Vernon residents in and out of Skagit County. Big Lake Moving - Beautiful countryside meets small town living in Big Lake. We are glad to serve local residents with moving services. Sedro-Woolley Moving - With moving to or from Sedro-Woolley, our movers and trucks can get the job done efficiently. Bellingham Moving - With it's beautiful Puget Sound park, colleges, art scene, outdoor recreation and snowcapped Mount Baker looming off to the east, Bellingham draws people from many walks of life; if that's you, call on Careful Movers for all your professional moving needs. Blaine Moving - Blaine is a small town but close to everthing that both Vancouver, BC, Bellingham and other areas have to offer. We offer a variety of Blaine moving services. Spokane - We offer moving services to or from Spokane, Cheney, Liberty Lake, and across Spokane County. Yakima - Across the Yakima area, we provide long distance moving services. Ellensburg - From Ellensburg and across the region, we provide long distance moving to or from the area. Boise - We offer moving services to or from Idaho including Boise, Coeur d'Alene (CDA), Sandpoint, and other Idaho cities. Idaho - Our long distance moving services from the Puget Sound area to Idaho have you covered, whether coming or going.